crafty lil' thing: Oh my, could that be me? Oh my, could that be me? I found this picture here this morning, and I'm pretty sure that's me on the left. 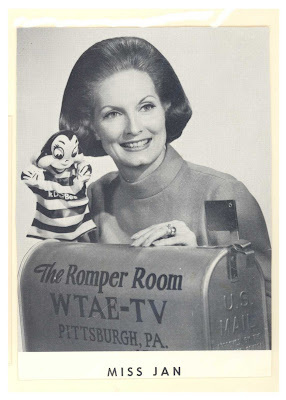 When I was about 5, I was a guest on Romper Room in Pittsburgh. The show was hosted by the lovely Ms. Jan. It was very long ago and I don't remember being on the show, but I still remember her face and still have the nicest feeling when I see her picture. I have been told, over and over, that I was "So Funny" when I was on the show. That's me on the left. I get the feeling, Ms. Jan kept me right where she could keep an eye on me. 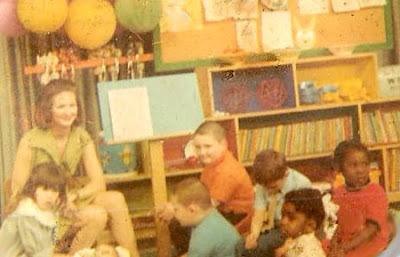 Yup, that's me in the yellow dress. 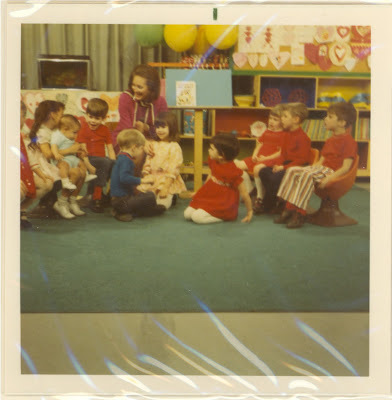 I think I visited the set of Mr. Rodgers Neighborhood while filming Romper Room. I couldn't find it, but I also have a picture of myself with Mr. McFeely. I'm told I was shy of Mr. Rodgers, but I liked Mr. McFeely and he took me to visit the Land of Make Believe. When we got there, Mr. McFeely introduced me to Owl and we got on like a house a fire. We talked and talked. It wasn't till years later that I realized it was Mr. Rodgers in the tree. When I was a little older, we moved into Mr. Rodgers neighborhood. We didn't know until after we had lived there a while. I trick or treated at his house once dressed as Princess Leia. He was very nice. I think he gave out Snickers bars, the big ones. Years later, I stood in front of his house and sang "We are the people in your neighborhood." It was a college thing. He didn't call the police. Nice man. I am so jealous of you! 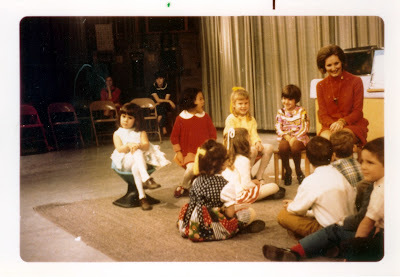 I used to love Romper Room and Mr Rodgers. I always dreamed of being on the show. So neat that you have these pictures and memories! I wish I could rememeber actually being there. According to my Mom, I was very entertaining. Several years ago I saw a society article that mentioned Ms. Jan. I wrote the author and she passed a Hello and Thanks to Ms. Jan for me. I got a Thank You back. Sweet lady. 43 inches down. Only 149 to go! Peter Davison is K's Doctor too!